Diabetes hs reached epidemic proportions globally. In its 2016 Global Report on Diabetes, the World Health Organization (“WHO”) estimated that 422 million people worldwide have the disease – 314 million more than in 1980. Approximately 8.5% of adults worldwide have diabetes. Approximately $920 billion is spent annually in the treatment of diabetes and related healthcare. Approximately 10% of every healthcare dollar is estimated to be spent on care for people with diagnosed diabetes. Approximately 30 million people in the U.S. have diabetes. About $615 million are spent annually in the treatment of diabetes alone. The worldwide market for diabetes treatment has been projected to reach $650 billion by 2020. Diabetes is caused by insufficient availability of, or resistance to, insulin. Insulin is produced by the islet cells of the pancreas. Its function is to assist in the transport of sugar in the blood to the inside of most types of cells in the body where it is used as a source of energy for those cells. In Type 1 diabetes the islet cells of the pancreas have been destroyed – usually by an autoimmune reaction. Type 1 diabetics require daily insulin administration through injection or through the use of an insulin pump. In Type 2 diabetes the body does not use insulin properly. This means the body has become resistant to insulin. Type 2 diabetes can generally be controlled by diet and exercise in its early stages. As time goes by, it may be necessary to use antidiabetic drugs to control the disease. However, over time these too may lose their effectiveness. Thus, even Type 2 diabetics may become insulin-dependent. In an effort to “cure” Type 1 diabetes, replacement of damaged pancreatic islet cells has been attempted. This involves transplantation of the entire pancreas or of its beta islet insulin-producing cells. In 2000, islet cells from human cadavers were transplanted into 7 insulin-dependent diabetics in a clinical trial carried out in Edmonton, Canada. The procedure was known as the “Edmonton Protocol.” Each patient enrolled remained insulin-independent for one year. But because of the high doses of immune-suppressive drugs that must accompany such transplantations, patients were placed at high risk of infection and even cancer. These drugs have serious side effects and have required patients to cease treatment with them. Worldwide, less than 1,000 people with Type 1 diabetes are known to have been transplanted with pancreatic islets from another human. Attempts to avoid the use of islet cells from human donors, have led to islet cells from pigs being used. This type of interspecies transplantation is known as xenotransplantation. Drug regulatory authorities have shown resistance in approving the use of such interspecies transplantations. In addition, there are problems besides regulatory approval, the foremost of which is an attack by the body’s immune system on the transplanted cells. To protect the non-human cells from attack by the immune system of the human being, they have been encapsulated using other forms of encapsulation technology than we use. In those studies, the transplanted islet cells from pigs were surrounded by a s capsule typically made of alginate (a derivative of seaweed). However, to translate this concept into a viable treatment for Type 1 diabetes, researcher’s efforts have been plagued by poor survival of the transplanted islet cells. In addition, the integrity of capsules composed of alginate has been shown to degrade over time. This then allows for immune system attack on the transplanted pig islets and necessitates additional transplantations. Also, as the alginate “capsules” degrade, they can elicit an immune response. Different tubular and planar “chamber-type” immune-protective devices that contain islet cells are under development by other companies. These devices are placed in the body where they can be retrieved and replaced when necessary. Tubular chambers have shown good biocompatibility, but they are subject to rupture, exposing the islets to immune system attack. They also require large numbers of islet cells. Planar chambers are more stable, but they can cause extensive foreign body reactions in the host resulting in fibrotic overgrowth and thus transplant failure. The most extensively researched immune-protective strategy is that which employs microcapsules. They are relatively simple to manufacture, can be implanted into the body without major surgery and, depending on the nature of the encapsulation material, micro-encapsulated cells can be cryopreserved. Micro-encapsulated islet cells first made their appearance in 1994 when a diabetic patient, already receiving immunosuppressive drugs, was transplanted with these cells encapsulated in alginate and remained insulin-independent for 9 months. However, 22 years and numerous clinical trials later, there are still no reports of long-term insulin-independence in non-immune-suppressed diabetic patients receiving encapsulated pancreatic islet transplants. We plan to develop a therapy for Type 1 diabetes and insulin-dependent Type 2 diabetes. Our therapy involves encapsulation of human cells that have been genetically engineered to produce, store insulin and release insulin on demand at levels in proportion to the levels of blood sugar (glucose) in the human body. We also plan to explore the encapsulation of human stem cells and beta islet cells as an alternative to using genetically modified human liver cells. The encapsulation will be done using the Cell-in-a-Box® technology. Insulin-producing cells (HIT-T15) have already been encapsulated using the sodium cellulose sulfate-based technology found in Cell-in-a-Box®. Encapsulation did not affect cell viability or insulin production. 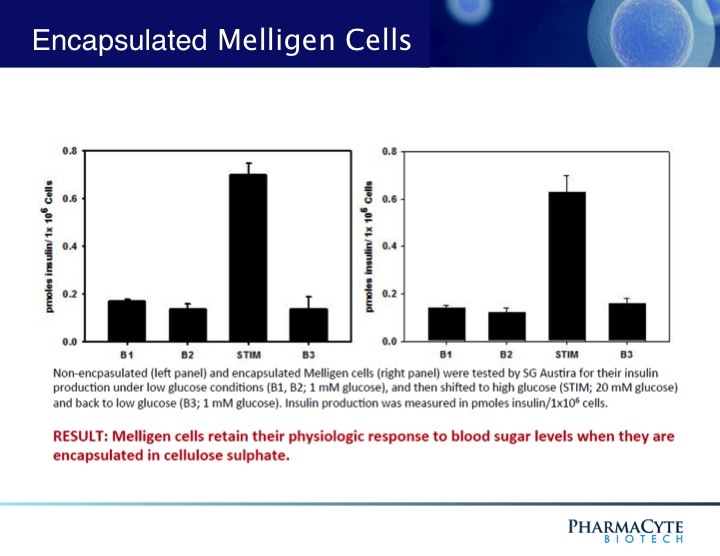 In cell culture, the encapsulated cells were able to detect the glucose concentration in a nutrient solution and react in a proper way by producing insulin. In the opinion of the authors of the study, encapsulation of insulin-producing cells with sodium cellulose sulfate, which is more biocompatible and less immunogenic than other encapsulation materials, seemed to be a promising method for the immunoisolation of porcine beta islet cells for xenotransplantation to replace the endocrine pancreas. Schaffellner S., et al. In an effort to avoid the use of non-human islet cells in its diabetes treatment, PharmaCyte has obtained from the University of Technology Sydney (“UTS”) in Australia an exclusive, worldwide license to use insulin-producing genetically engineered human liver cells developed by UTS to treat Type 1 diabetes and insulin-dependent Type 2 diabetes. These cells, named “Melligen,” have already been tested in mice and shown to produce insulin in direct proportion to the amount of glucose in their surroundings. In fact, when Melligen cells were transplanted into immosuppressed diabetic mice, their blood glucose levels became normal. The Melligen cells reversed the diabetic condition. Melligen cells can be readily grown in culture and are available in unlimited supply. Compared to native pancreatic beta islet cells, Melligen cells are much more resistant to the pro-inflammatory cytokines that have been shown to be involved in beta islet cell death. We believe that this property makes them an ideal potential candidate cell line for beta islet cell replacement therapy with the prospect to achieve long-term transplant graft function. However, further research and development (“R&D”) needs to be done with the Melligen cells to insure they function as reported in the literature by UTS. PharmaCyte has acquired from Austrianova an exclusive, worldwide license to use the Cell-in-a-Box® technology for the development of a treatment for diabetes. We believe that encapsulating the Melligen cells using Cell-in-a-Box® live cell encapsulation technology has numerous advantages over encapsulation of cells with other materials, such as alginate. Since our capsules are composed largely of cellulose (a bio-inert material in the human body), the Cell-in-a-Box® capsules are durable, resilient and long-lasting when compared to the competition. They remain intact for long periods of time in the body, all the while protecting the cells inside them from immune system attack. Also, in prior studies these capsules and the cells inside them have not caused any immune or inflammatory responses like those seen with alginate-encapsulated cells. Studies have shown that the Cell-in-a-Box encapsulation process does not reduce the capability of the Melligen cells to produce insulin. We believe that the combination of the Melligen cells and the Cell-in-a-Box® encapsulation technology could lead to a breakthrough therapy for Type 1 diabetes and insulin-dependent Type 2 diabetes. Encapsulating the Melligen cells could enable us to overcome all of the past problems in developing a true bio-artificial pancreas. Members of our International Diabetes Consortium (see under “Company” tab), are working in concert to develop our therapy for insulin-dependent diabetes.